Despite Tuesday’s deadly Amtrak crash that killed seven and left 200 injured in Philadelphia, the House Appropriations Committee backed a $55 billion transportation bill that would cut roughly $251 million from Amtrak’s budget. Wednesday’s 30-21 vote was conducted along party lines, with Republicans voting in favor of the budget cut and Democrats lining up against it. If passed into law, Amtrak’s budget allocation would be $1.13 billion in the upcoming fiscal year, down from nearly $1.4 billion. Chairman of the House Appropriations Committee Harold Rogers (R-Ky.) said the majority of Republicans – who are in control of Congress – were hamstrung in their voting because of automatic spending cuts set to take place as a result of a budget deal between Obama and Republicans in 2011. "We have no choice but to abide by the law," Rogers told reporters. President Barack Obama had asked for almost $2.5 billion for Amtrak in his February budget, to be used for capital investment in tracks, tunnels and bridges. The request included $400 million in grants for capital construction along Amtrak’s Northeast corridor, where last night’s accident happened. "Every day, tens of thousands of passengers travel our nation's railways on Amtrak — a majority of those along the Northeast Corridor where yesterday's tragic accident occurred," said Rep. Chaka Fattah, who represents Philadelphia, during the vote debate. "These riders deserve safe, secure, and modern infrastructure." Republicans accused House Democrats of jumping to conclusions about poor funding and train crashes. They blocked amendments that would have boosted funding to Amtrak. One such amendment would have provided the train network with $2.5 billion. “I was disappointed to hear my colleague talk about the funding for Amtrak and to suggest that because we haven’t funded it, that’s what caused that accident, when you have no idea what caused the accident,"Rep. Mike Simpson (R-Idaho) told the Hill. White House spokesman Josh Earnest told reporters Obama’s budget called for a $1 billion increase in funding for Amtrak and criticized Republicans for backing cuts to the rail agency. Investigators said in their preliminary investigation that Tuesday’s derailed Amtrak train was carrying 238 passengers and five crew members, and exceeded 100 miles per hour on a curved part of the track that had a 50 mph limit. 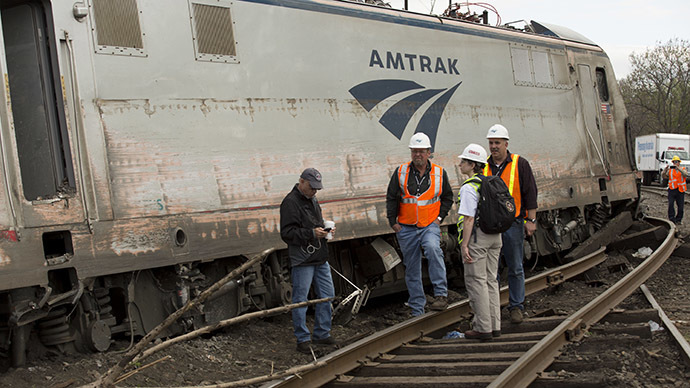 Rescue workers are still searching through the wreckage of Amtrak train number 188. Seven people have been confirmed dead and more than 200 have been treated for injuries at Philadelphia hospitals. The authorities have not yet accounted for all 243 people on board. “We have made really good progress in accounting for the majority of individuals, but we still have folks that we’d like to hear from,” Sam Phillips, Philadelphia’s director of emergency management, told reporters. Passenger rail services along the Northeast Corridor, the busiest in the US with 12 million passengers a year, remain on hold. Commuter rail services that share Amtrak’s tracks in the Philadelphia area have also been suspended. The service is used by many Congress members to travel to and from their home districts. Also pressing for long-term infrastructure funding are the nation’s mayors, who are meeting this week in Washington, DC. At a press conference of a bipartisan coalition of mayors, New York City Mayor Bill de Blasio told reporters that every one of his colleagues have infrastructure that’s starting to fail or is intensely insufficient. “When you put that in the context of not just safety of our people or the strength of our local economies – but when you put it in the context of our ability to compete in a globalized world – our nation’s ability to compete economically – all the indicators point to one thing – you only can move forward if you invest. We know our competitors are investing,” said de Blasio. De Blasio told reporters New York has 100 bridges that are 100 years old and, while the city had increased budget spending on infrastructure by 50 percent, it needs the help from the state legislature and federal partners. “Federal investment has not kept pace with this demand, resulting in an outdated, overburdened surface transportation system that is ill equipped to handle current, let alone future, need,” he said.